The wiring is coming along nicely, especially considering that I have only been able to work on it a small amount everyday on my lunch break and not at all on the weekends. Most of the interior harness is finished with brake lights/turn signals, power locks/windows, power sunroof, ect all finished up it was time to move on to the front of the car so I could finish all the lighting. Took home the stock engine room harness this weekend to strip it and get everything prepared to wire in this coming week. 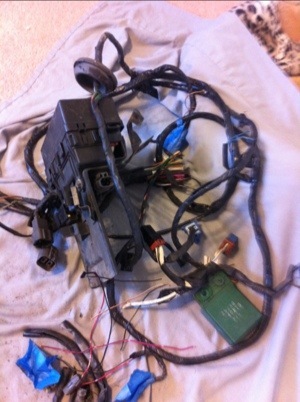 Here is the headlight and turn signal part of the harness stripped and labeled ready to be wired to the chassis. Still need to add the wiper motor and amp and probably move the radiator fans from their temporary wiring over to this harness as it will be a lot cleaner and look more complete. Also pictured is the extra junk that was removed. 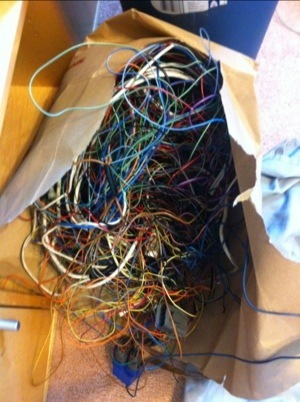 About 10lbs of fuse box’s and wiring. 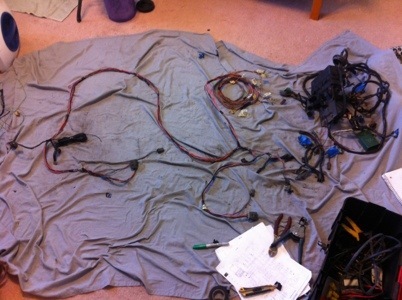 Of course I didn’t re-wire this car for the weight savings I just like to clean things up and the stock wiring was so hacked with random bits of speaker wire and twist connectors everywhere it’s no wonder why the shell was sold I really believe nothing electrical was working with all the hack jobs. ~ by B. Rogers on June 2, 2012.